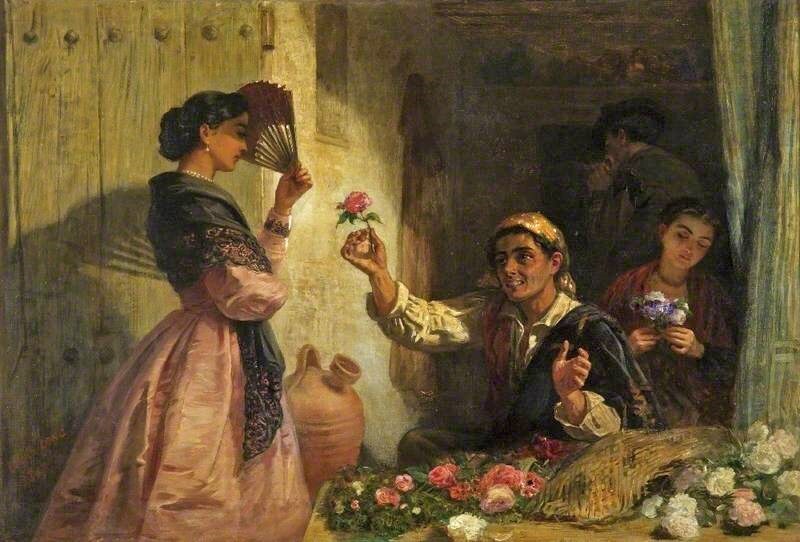 Flower sellers were common on the streets of London, Paris, & other European urban centers. We can glean some information about British flower sellers from Victorian London census records which reveal that most were married women & widows ranging from older teens to women in their 50s, single women, mostly enumerated as "daughter" are far fewer & make up a small percentage of the total. We can see the occasional "flower girl" who was put out onto the streets to sell flowers in order to help with the family income. Flower sellers didn’t just sell cut flowers, which had to be sourced at dawn, taken home, made up into bunches & then taken out onto the streets to sell from a basket, wheelbarrow, hand cart, or temporary stall in high traffic areas such as informal markets or lining the streets of busy thoroughfares. They also sold pot plants, "roots," seeds, there was a hierarchy within the occupation as described by Henry Mayhew (1812-1887) in London Labour & the London Poor. 1851. "The street-sellers of whom I have now to treat comprise those who deal in trees & shrubs, in flowers (whether in pots, or with soil attached to the roots, or cut from the plant as it grows in the garden), & in seeds & branches (as of holly, mistletoe, ivy, yew, laurel, palm, lilac, & may). The “root-sellers” (as the dealers in flowers in pots are mostly called) rank, when in a prosperous business, with the highest “aristocracy” of the street greengrocers. The condition of a portion of them, may be characterized by a term which is readily understood as “comfortable,” that is to say, comparatively comfortable, when the circumstances of other street-sellers are considered...Dealers in trees & shrubs are the same as the root-sellers. The same may be said, but with some few exceptions, of the seed-sellers...The root-sellers do not reside in any particular localities, but there are more of them living in the outskirts than in the thickly populated streets. The street-sellers of cut flowers present characteristics peculiarly their own. This trade is mostly in the hands of girls, who are of 2 classes. This traffic ranks...among the lowest grades of the street-trade, being pursued only by the very poor, or the very young." Mayhew provided extensive descriptions of...potted plants & cut flowers. The seller ordinarily confined herself "to the cheaper sorts of plants, & rarely meddles with such things as acacias, mezereons, savines, syringas, lilacs, or even myrtles, & with none of these things unless cheap." Street sellers, often called costermongers in Britain, were known to have been in London from the 14C, & possibly much earlier. Mayhew, writing in the 1840s, called costermongering an "ancient calling" & attributed the 1st written descriptions of the street sellers' distinctive cries & sales patter appearing in a ballad, entitled London Lyckpeny by John Lydgate probably written in the late 1300s & 1st performed around 1409. William Shakespeare (1564 -1616) & Christopher Marlowe (1564-1593) both mention costermongers in their writings. Initiatives to rid the city of street traders were common during the reigns of Elizabeth I (1558–1603) & Charles I (1625–1649). These attempts failed & the number of London-based street vendors, plus those in large European cities, surged in the 18C & 19C.